Good menu cards do more than providing a list of all the food items and meals that a dining establishment offers. Most importantly, they also serve as an alternative way of promoting one’s business. That is why when creating a menu card design for any kind of food establishment, one needs to understand the psychology of a good menu card design. 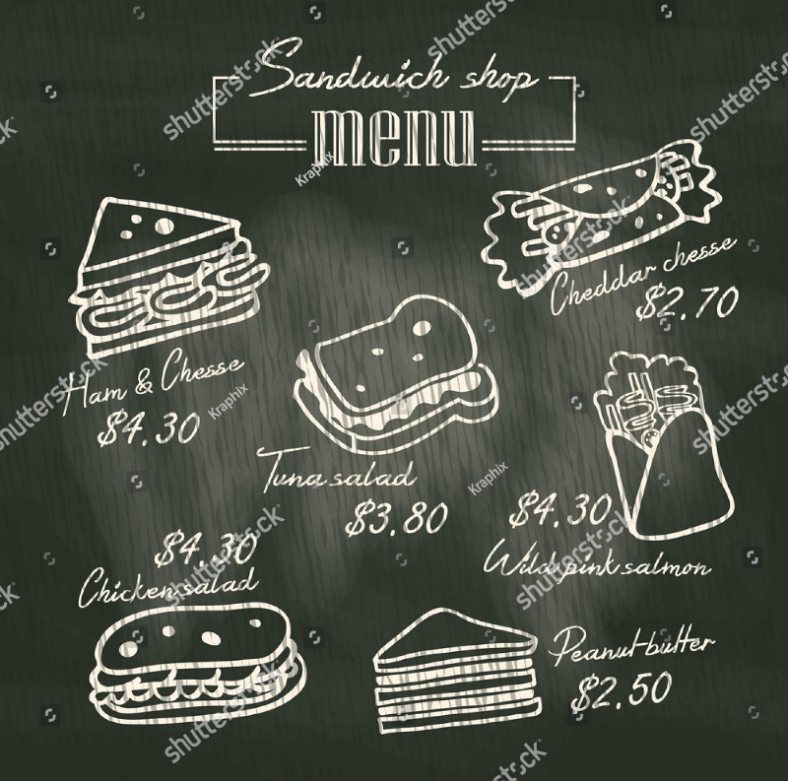 In this article, we provide different examples of sandwich menu designs that business owners may easily replicate for their own food business, especially those who are operating sandwich shops. You will also learn specific steps on how to quickly recreate each design element. 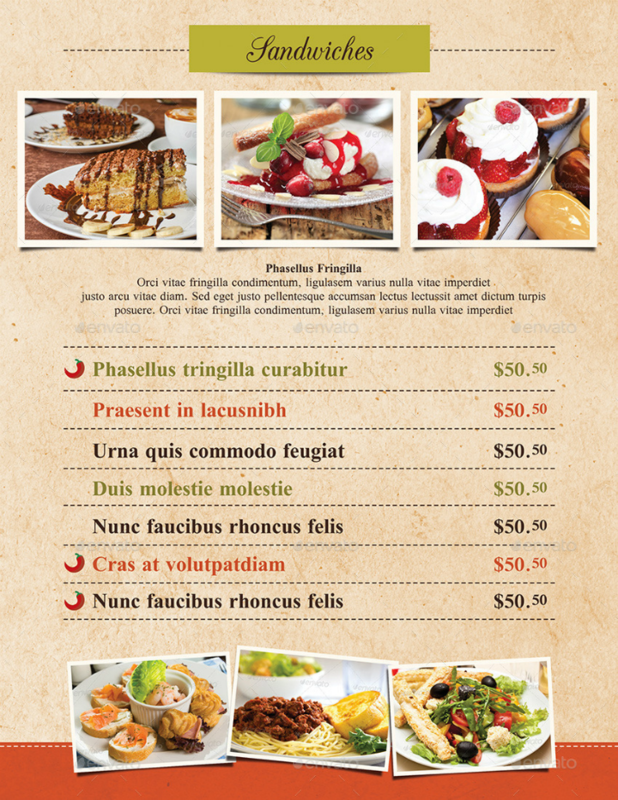 The steps for creating menu cards is relatively easy. 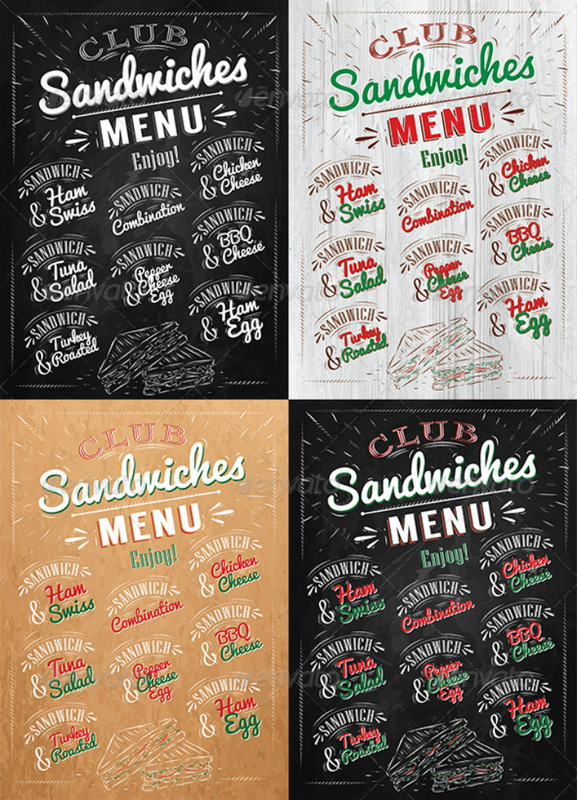 However, compared to creating regular menu cards, a key difference may lie in the specific design layout that is used for creating sandwich chalkboard menu designs. 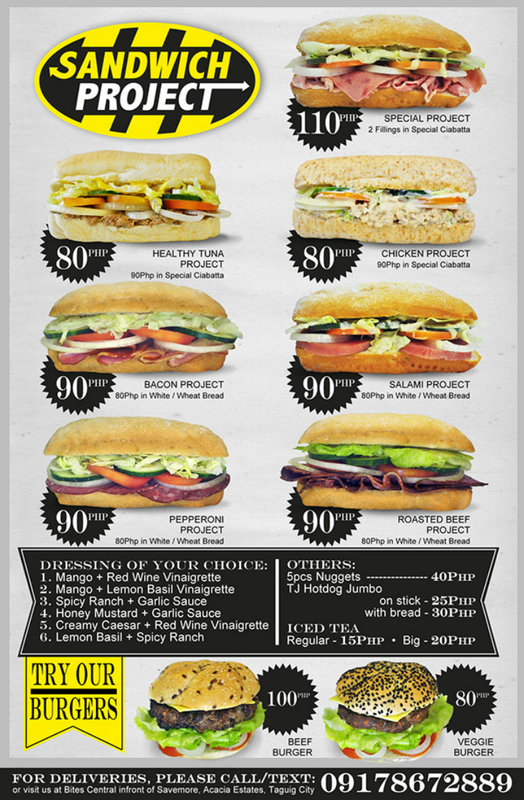 In crafting sandwich menu cards, one needs to highlight the different kinds of sandwiches that a store offers. This way, each kind of sandwich will have a distinct look that will help attract more customers. Decide on a color scheme and layout. 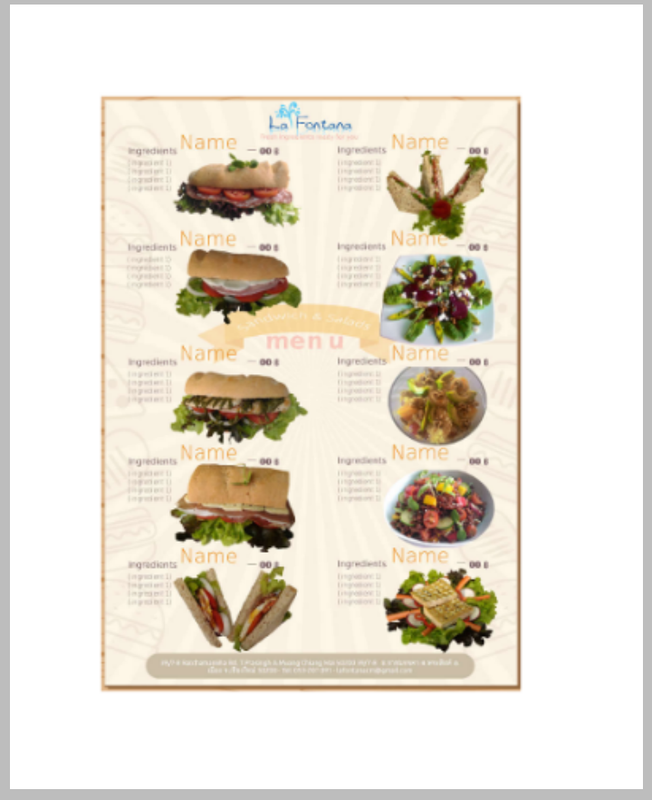 Just like in any type of card template design, you need to choose a color scheme and layout for your sandwich menu. This step may seem like it is easy to accomplish, but it is not. Finding a color scheme that will best fit your business’ image and a layout that will incorporate all the information you want to be seen in your menu card can be very difficult. That is why you should do this step first. Once you get this step out of the way, the next steps will be easier to manage and complete. Determine if you want a menu card design filled with images only, text only, or both. The next step is to decide whether you want your sandwich menu design to have more images or more descriptive text or both. Remember that menu cards follow different standardized formats and you may only have a very small space to write sandwich descriptions. This is especially important when creating small restaurant menu templates. On the other hand, if you are looking to create larger restaurant menu designs, you may have a bigger space to work on. Larger menu card sizes make it easier to incorporate high-quality images. Take good pictures of all the sandwiches that you serve. In relation to the previous step, you also need to have pictures of the different sandwiches that your restaurant offers. These images will be used in the menu card design and will help convince a customer when choosing between different sandwich types. The type of menu layout template that you will use will also depend on the type of photos that you already have or vice versa. Make sure to include the price for each menu item. Understanding the psychology of a good menu design means that you know what design elements to include and not to include in your menu. One of the most important things to include in a sandwich menu is the cost of each sandwich. However, menu card designers should not include the currency sign as this may signal the costliness of a specific meal or food item. Include company logo or branding. As mentioned in the beginning of this article, a business’ sandwich menu is also a form of print advertisement. That is why you should incorporate different branding elements in your menu. For instance, you may incorporate food icons to act as your company logo if you do not yet have one. 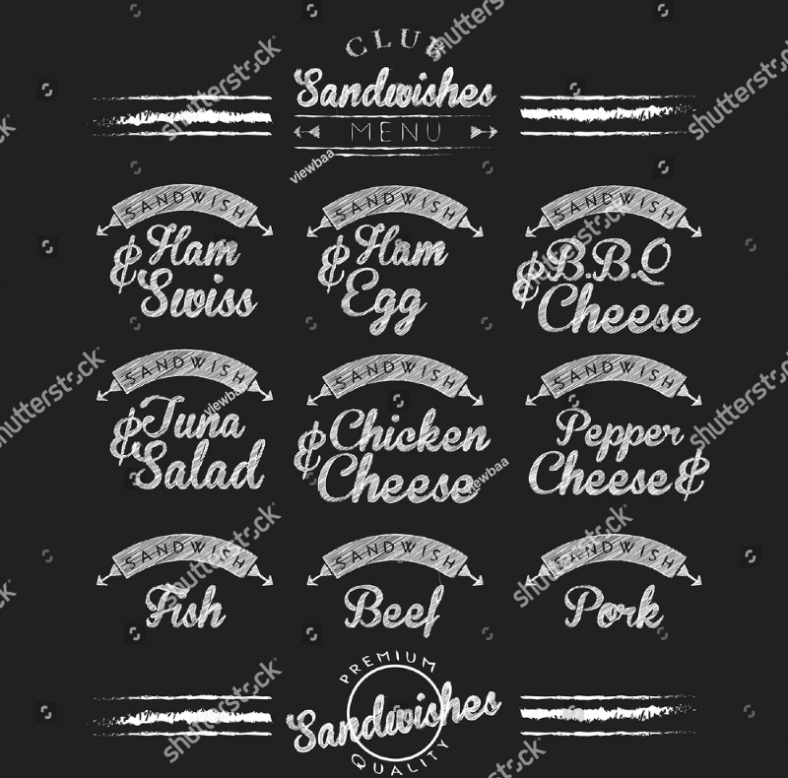 And if you already have a business logo design, make sure to add this to the sandwich menu design. Proofread all text and design elements. Creating any type of menu card template is not complete if you do not proofread all the design and text elements included in your menu card template. This step is essential so that designers can spot any grammatical errors, pricing errors, and image issues before the sandwich menu is printed out and given away to customers. Imagine not spotting a pricing error in a menu card ahead of time. This could cause customer complaints of misrepresentation and may also eventually result in loss of revenue. 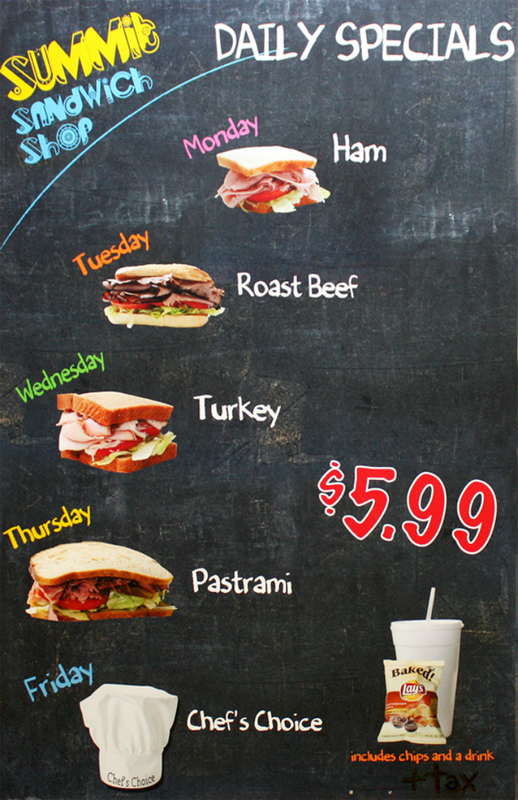 Print the sandwich menu on high-quality paper. Once you are satisfied with the sandwich printable menu template that you have created, it is time to print out the menu card. It may be best to go to a professional print shop that can print the design on quality card stock or paper. If you or your company would like to do the printing in your office, it may be best to invest in a commercial grade laser or inkjet printer. 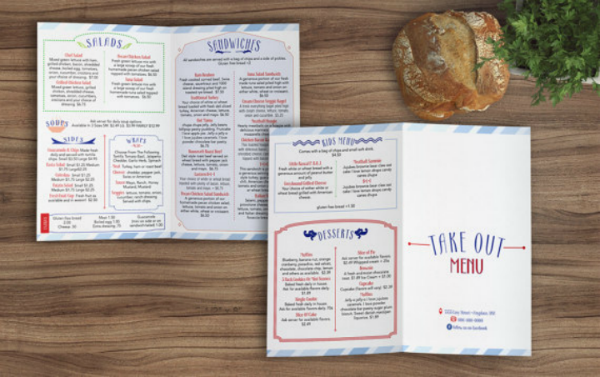 Save a copy of the menu card in editable PSD or InDesign format. Dining establishments frequently have to reinvent themselves in order to stay relevant in the mainstream market. And one of the first things that will be changed is often a restaurant’s menu card design. To save yourself from the hassle of creating a sandwich menu template from scratch, make sure to save a copy of the menu card designs in PSD or InDesign format. Storing a file in this way will allow you to retrieve it and make necessary corrections on the different layers on the file. 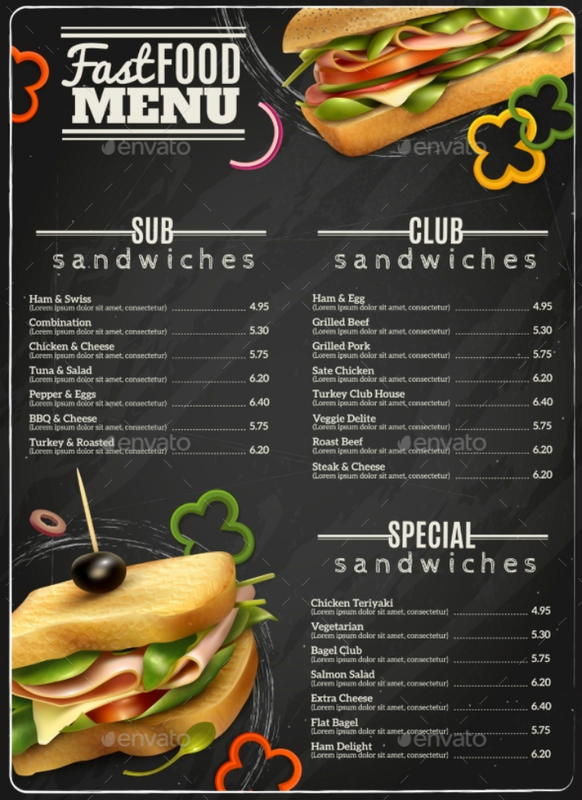 Choose the Classic Sandwich Menu Design if you have a formal restaurant and a corresponding formal main menu design. Clean menu card designs often work well for these kinds of dining establishments since food images and the corresponding menu lists are not crowding out each other. Some sandwiches are now considered as part of the fast food menu since they are very easy and fast to prepare. If you are operating a fast food franchise or even a food cart business, using the Fast Food Sandwich Menu Design featured above will suit your business model. 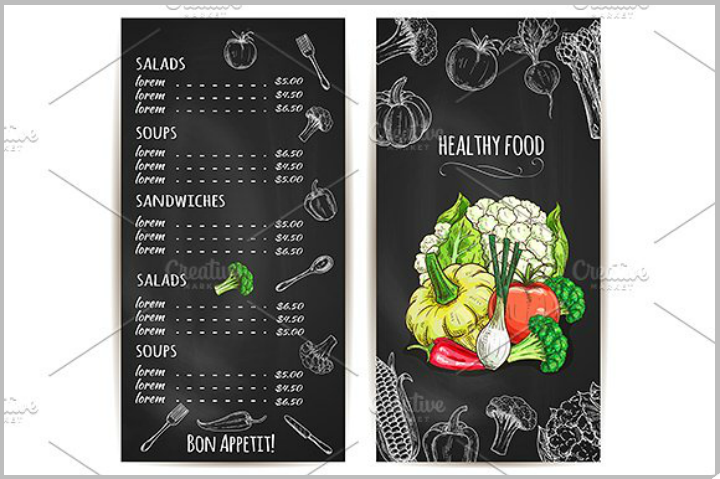 This menu card design may be used as a banner add to be placed on your food stall or in a counter. It may also be printed on card stock and individually given to walk-in customers. For those who are operating themed restaurants and those who would prefer a text-heavy menu design, the Hip-Hop Rap Cafe Sandwich Menu Design will work wonders for your dining establishment. Highly customized menus like this may also work especially well for pizza places by using custom-made pizza menu templates. The Sandwich and Salad Menu Design Template embedded above sports a perfect combination of images and text. In some sense, this menu design can also be considered minimalist since it makes use of images and text presented in an organized manner. 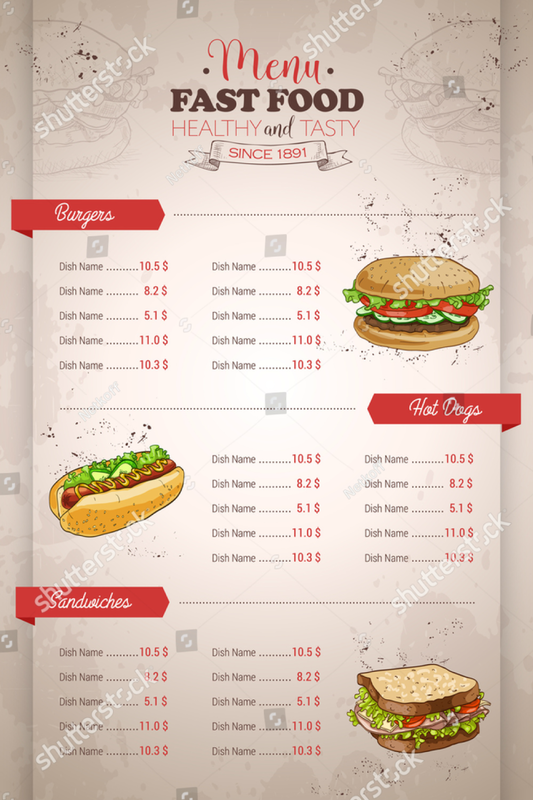 The Sandwich Doodle Menu Design pictured above is a good menu design for cafes and local diners who want a cozy feel and ambiance to their establishments. Just like any chalkboard designs, this menu design is best replicated on an overhead blackboard found on a cafe’s counter. Incorporate a little bit of history. When John Montagu first asked his valet for cold beef placed between slices of toast, he did not know that his actions will help propel the popularity of what we now call a ‘sandwich’. Montagu was a 18th century British Earl of Sandwich; hence, the name sandwich was derived from the name of his title. Adding a little bit of history like this can be helpful in spicing up any sandwich menu template. To insert information like this on a menu card, you may have to design a larger menu card. Add customer loyalty incentives. As a way to help increase customer engagement, you may add customer loyalty verbiage on your sandwich menu. To illustrate, you may offer a discount for customers who purchase meals or food items reaching a certain amount. This is a marketing tool used by most retailers and there is no reason why food companies cannot follow this technique. Use different menu formats. To prevent customer and staff boredom, a restaurateur may make use of different sandwich menu card formats for each customer interaction. To illustrate, sample menu flyers may be used to advertise the business and given away to people passing by the restaurant. 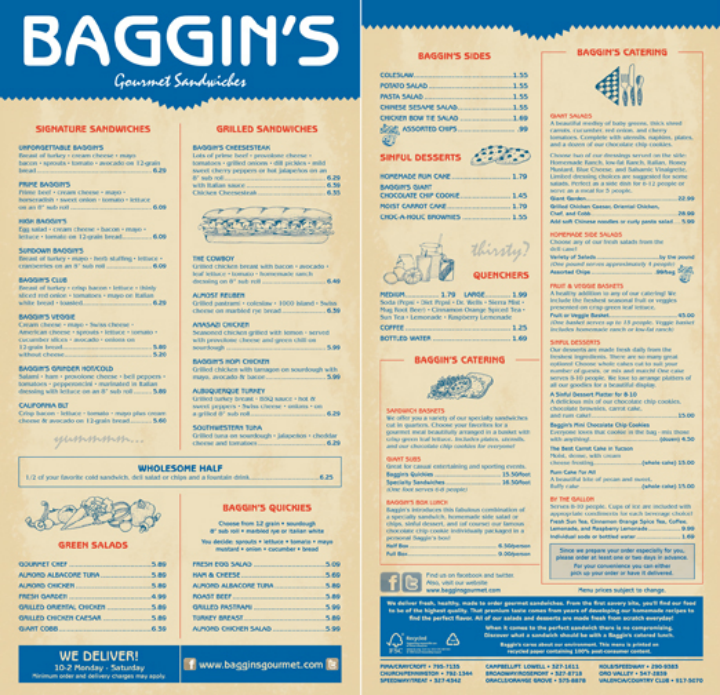 Large menu designs may be displayed on the counter of a diner so that customers can order easily while takeout menu card templates may also be given to customers after they have dined. This way, they can take the takeout menus at home and order any takeout meals from their respective homes. Set up a delivery service menu. Delivery services are one of the new things that different food businesses need to look into for them to stay competitive. Developing a delivery service menu gives restaurateurs access to a new market, possibly increasing their market share in the future. Customers may also benefit from this new strategy of food delivery since they do not have to visit a physical restaurant or store to enjoy their favorite meals.